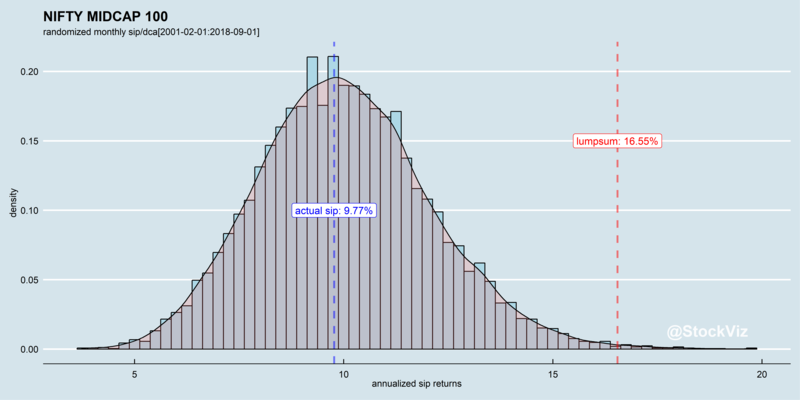 Our previous post on Lumpsum vs. SIP returns showed how, given the way returns are statistically distributed, lumpsums tend to perform better than SIPs. The analysis side-stepped a lot of issues with using a single market-price time-series by fitting the weekly returns of the index into a Generalised Lambda Distribution and then using that model to run a simulation. This may not seem “real” to most investors. 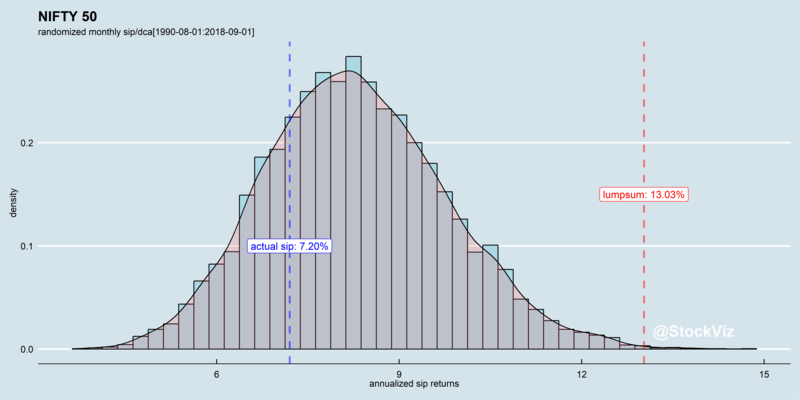 Even through the weekly returns obtained by querying the model is from the same distribution as that of the index, it may not reproduce the exact path that the index took. In this post, we will present a simpler analysis that should be more intuitive. Most SIP/DCA investors setup a monthly purchase and let it run for a period of time. So we will mimic that process by using monthly returns for our analysis. Moreover, instead of building a statistical model, we will just randomly shuffle the observed set of monthly returns to obtain a return series for our simulation. Each simulation will then end up having the same monthly returns but in a different (random) order. We then calculate SIP/DCA returns for each of those and plot them as a histogram. 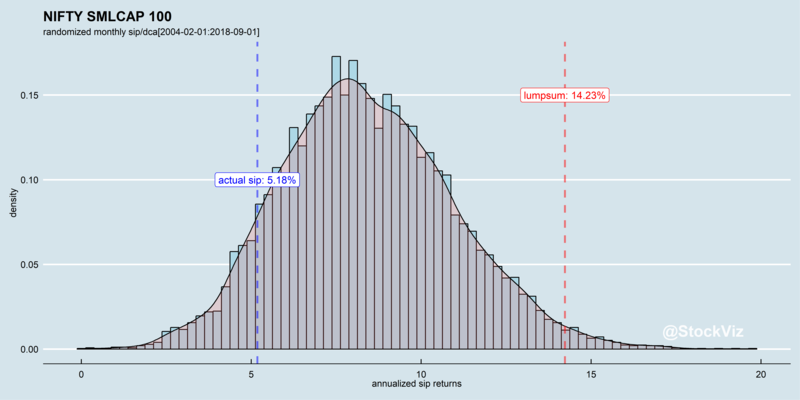 What the above chart means is that both SIP/DCA and lumpsum actual returns are path dependent. A re-ordering of the same monthly returns end up giving vastly different results. This also shows why even if a particular investment gives superior returns, individual investors can still end up with poor returns because of path dependency. *Key assumption here is that monthly returns are randomly distributed. But trend-followers would disagree on that point.